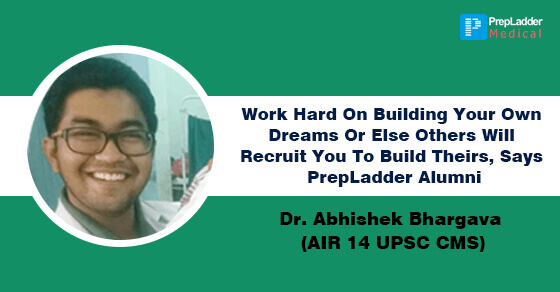 PrepLadder wishes heartiest congratulations to its alumni Dr. Abhishek Bhargava for securing AIR 14 in UPSC CMS 2017. We wish him success and a great future ahead. In this exclusive interview with PrepLadder he shares tips on how you too can achieve your dream seat. Dr. Bhargava: Hi, I am Dr. Abhishek Bhargava from Jaipur. I have done my MBBS from Sawai Mansingh Medical College, Jaipur. I have secured rank 14 in UPSC CMS 2017. What do you think is the correct approach to study for UPSC CMS? Only Medical content or Medical content + General ability? Dr. Bhargava: According to me, a good knowledge of medical content is sufficient enough for cracking UPSC stage 1 but having said that I do believe that a brief brush-up of general ability by going through general ability questions of previous years does provide a definite edge over others. There are short videos on geography and civics on youtube which a candidate can go through few days just before the exam. Dr. Bhargava: For clearing UPSC CMS exam, 3-4 months preparation is ideal. Have you attempted UPSC CMS previously? If yes, what did you do different this year that lead to your success? Dr. Bhargava: This was my first attempt. Dr. Bhargava: Prepladder played a vital role in helping me secure this rank. I had joined the UPSC CMS test series of PrepLadder. Doing previous years questions and new questions on the site helped me ascertain the pattern and difficulty level of the exam. It also helped me analyze the frequently repeated topics in UPSC. The exam software was an exact replica of the PrepLadder so that too helped me soothe the nerves during the exam because I was already well versed with it. How big is the role of practice and revision while preparing for UPSC CMS and how much time should be dedicated for it? Dr. Bhargava: Practice does make a difference. I used to do one question paper everyday in the last month from the UPSC test series of PrepLadder. This played a vital role in helping me determine my weak topics. Dr. Bhargava: Yes I did make a study plan but could not stick to the schedule strictly. However, I think making a schedule does help you set priorities. Dr. Bhargava: I was in the top 5 during MBBS. I scored 70% overall. Dr. Bhargava: Surgery was the most difficult for me and the easiest one was Medicine. One mistake that you believe everyone must avoid while preparing for UPSC CMS. Dr. Bhargava: UPSC CMS is an exam where topics are frequently repeated, so instead of a full course study from cover to cover I would recommend that candidates should focus on these topics and previous years papers to get through this exam. Some last tips for our readers preparing for UPSC CMS? Dr. Bhargava: Work Hard On Building Your Own Dreams Or Else Others Will Recruit You To Build Theirs. Hope this blog will give you some idea about how you can get your dream seat. Keep chasing your dream like a mission, it is meant to be accomplished.